Removes wax build-up from floors. Engine and Industrial plant cleaner. Removes tar and bitumen easily. Selpen S is ideal for removal of old wax from floors. It may also be used as a brush or spray on, hose off degreasant for engines and greasy metal parts. Selpen S also removes oil and diesel spillages from concrete and brick floors. Floor wax removal: Apply Selpen S neat. Allow to penetrate for ten minutes. Machine scrub preferably adding water to form an emulsion. Mop up or suction dry. Rinse and allow to dry before reapplying wax polish. Degreasing: Spray on. Brush if necessary to loosen impacted dirt. Hose off. N.B. 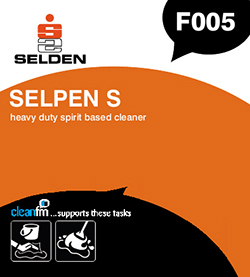 Selpen S should not be used on solvent sensitive surfaces e.g. thermoplastic or bitumastic.